To a fly fishing person, if there are fish it is paradise and the Salmon River on the Northern Peninsula of Newfoundland is just that. 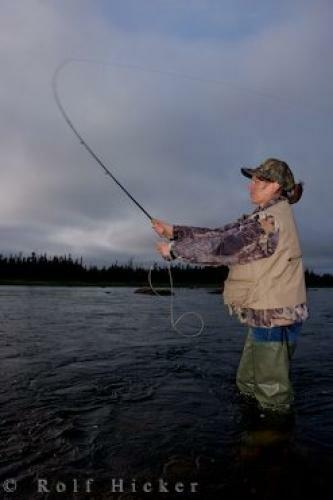 Fishing of any kind is a form of religion to the avid anglers, but fly fishing on one of the many Newfoundland rivers is considered paradise. The province of Newfoundland and Labrador, the combination province became official in 1964, contains 60% of the salmon rivers of the Atlantic Coast. The Salmon River, near the small town of Main Brook (population around 300) in Newfoundland, is a great place to fly fish for the Atlantic salmon and brook trout. Fly fishing is an art, using a fly rod and line with artificial flies as bait, supposedly Claudius Aelianus, a Roman teacher and author (and obviously a fisherman) used an artificial fly in the second century. near Main Brook, Newfounland, Canada. ... The Salmon River is close to the Viking Trail of Newfoundland and Labrador and it is inspiring to think of the possibility of those ancient Vikings fishing in these same waters. Woman fly fishing in Salmon River near the town of Main Brook, Viking Trail, Northern Peninsula, Great Northern Peninsula, Newfoundland. Model Released. I photographed this photo with the digital SLR camera model Canon EOS-1Ds Mark II, aperture of f/5.6, exposure time of 1/400 sec. on ISO 200, as always I used a original Canon Lens, the focus lenght for this picture was 28mm.